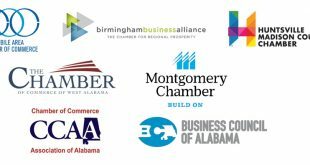 MONTGOMERY – ProgressPAC, the political arm of the Business Council of Alabama, has released an updated list of endorsements for the 2014 campaign cycle following a board of directors meeting. The first round of endorsements were released during a March 19 board of directors meeting in Montgomery. Under consideration were candidates for constitutional offices, legislative seats, the State Board of Education and congressional offices. The ProgressPAC board had previously endorsed statewide judicial candidates during their August 2013 meeting in Point Clear.